2 Have you ever seen a ladybug? Most ladybugs are red with black spots. But did you know that not all ladybugs are red and black? Some are pink, yellow, or orange. Some ladybugs are even white! 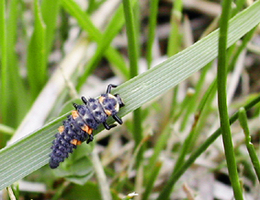 But these busy bugs, no matter what color they are, aren't born looking like the spotted beetles we're used to seeing.